BOOM! 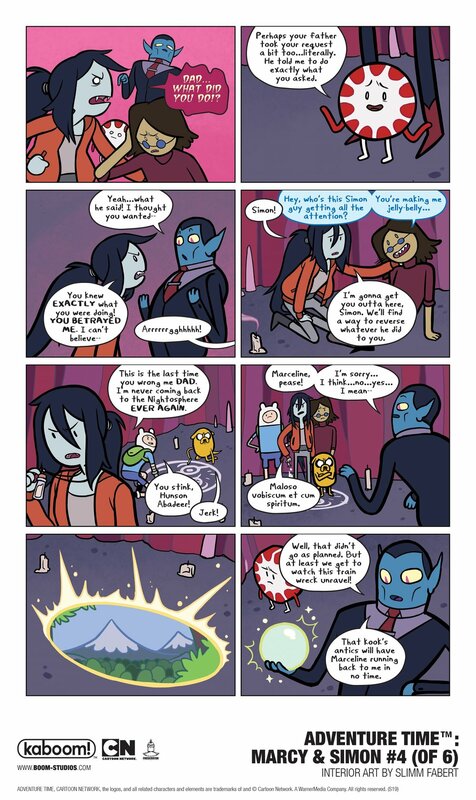 Studios and Cartoon Network gives us our first look at ADVENTURE TIME™: MARCY & SIMON #4 (of 6). 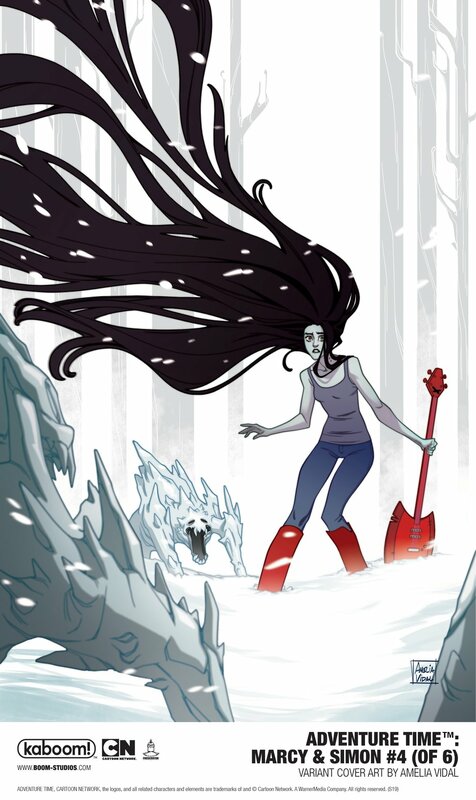 Writer Olivia Olson (voice of Marceline, Cartoon Network’s Adventure Time) and artist Slimm Fabert (Adventure Time comic series) bring fans the exciting official comic book continuation by revealing what’s next for the once immortal Simon and the still immortal Vampire Queen Marceline in comic book form. Marcy and Simon's friendship has endured over 900 years and through bouts of insanity and amnesia but just when Marcy thinks she’s found a way to restore Simon’s memories for good, things take a turn for the worse. The Dark Lord of the Nightosphere, Marcy’s dad, messed up and somehow mixed Simon’s identity with his Ice King persona. Now Simon’s caught between his present and his past, and Marcy thinks it’s all her fault. Will she manage to save Simon from the influence of dark magic and salvage their friendship with the help of Jake, Finn, Bubblegum, and the gang? Or will Simon succumb to the curse of the Ice King once more? ADVENTURE TIME™: MARCY & SIMON is Olson’s third writing contribution to the expanded literary world of the eponymous franchise, previously collaborating with her father Martin Olson (the voice of “Hunson Abadeer”) on The Adventure Time™ Encyclopedia. The two also co-authored Adventure Time™: The Enchiridion & Marcy's Super Secret Scrapbook, written from a first-person perspective through Marceline's diary entries about when she and Simon first met. Both Adventure Time books, published in partnership between Abrams and Cartoon Network, are available now everywhere books are sold. 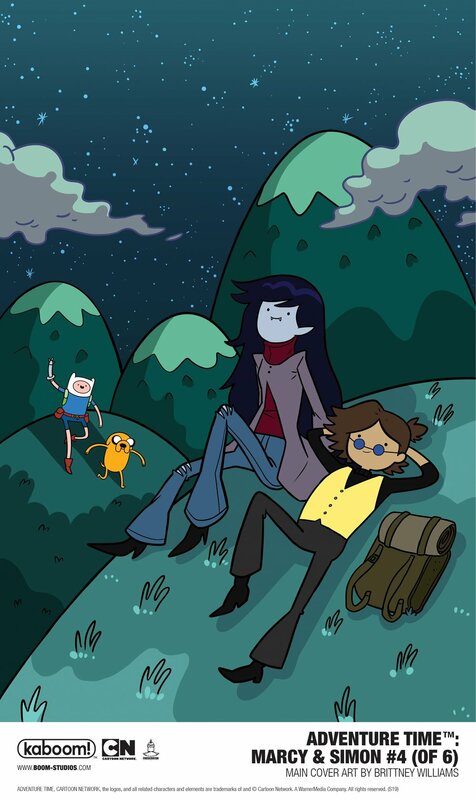 ADVENTURE TIME™: MARCY & SIMON #4 will be available on April 17, 2019. Are you a fan of Adventure Time? Let us know in the comment section below. Also, Don’t forget to like, share and subscribe to all things Constant Collectible to keep up to date with all the news and reviews from a world of GEEK CULTURE.